There’s Formaldehyde In My What?? Just the word formaldehyde gives me the creeps. 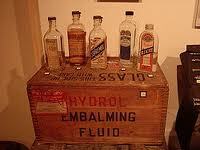 It just sounds like something deadly and ironically it’s a fluid that’s used to embalm bodies for open casket funerals. Believe it or not formaldehyde is in A LOT of things that we use on a daily basis and I am learning about new products almost every month that has this chemical in it. Just in case you do not know and I looked it up just to make sure I was passing along the right info, Formaldehyde is a preservation fluid that replaces the blood so that your loved one looks a little more real for the big send off. I also found out that it is known to cause cancer and no one wants the big C so let’s be more mindful of the things we put in and on our bodies You can find formaldehyde under different names such as diazolidinyl urea, imidazolidinyl urea, 2-bromo-2-nitropropane-1,3-diol (most commonly known as bronopol), and sodium hydroxylmethylglycinate. I found that you can get great deal of contact with this chemical from just getting ready for a girls night out. Lotions, nail polish, nail polish removers, hair products (Brazilian Blow Out) and it is even on some fabrics of clothing. So let’s be aware of these things and this is the purpose of this blog to educate on why natural is better for US. I have said it over and over, I am not 100% natural but as I learn better I can do and share better. I have a nice collection of nailpolish so Im not happy about what I have found out but hey I rather know the truth. We shouldn’t have to suffer the pain of cancer all over the wrong bottle of nail polish and lotion. I know we like to be fab and we like our products but you can still be gorgeous and healthy! Some of us are more sensitive than others so I found a list of reactions to exposure to formaldehyde so if you feel any of things after using certain products maybe you should check the label. For more info on this visit these websites that I have gathered my information from. I focussed on beauty products just to stay on topic of my blog but this stuff can be found all over your house so check your labels! I love organic pineapples I really wish I would have explored pineapples beyond consumption but i didn’t. I would have never thought to exfoliate with my favorite fruit. So this calls for a reblog and I will be trying this since I’m sure there are a lot of green pineapples floating around. I can’t wait to try this and I will be back with my pros and cons the minute I do. I have been using shea butter for at least 10 years. I would get it at the traveling African Market places that come around the city at different times of the year. I use it for my hair and skin. I’ll start with a little background information. Shea butter is a NATURAL product that is only made in the tropics of West Africa. Of course it is shipped all over the world now but naturally it is from Africa. Shea butter is made from a nut that comes from the African Shea Tree or what is also known as the Shea-Karite tree. Shea butter is made up of a rich amount of fatty acids that are irremovable. Shea butter is better than most of the natural vegetable butters and fruit butters because of the fatty acids that are essential to moisturizing the hair and skin. In comparison to coco butter it is better because it doesn’t get hard the way that coco butter does when it is stored. Shea butter is hard but coco butter gets rock solid and becomes very difficult to melt if you have ever stored coco butter you know this to be true. Shea butter has a lot of vitamins that are needed to make the skin and hair look and feel soft and healthy. Shea butter is in almost all of the OTC beauty products but it’s usually mixed with a lot of other junk and very watered down so it’s best to use it in its raw form. For skin: Shea butter protects the skin from wind, cold, sun, and it helps the skin heal from burns much faster than any other product. It stimulates cellular activity and it can fix dry, itchy, flaky skin. For hair: It can soften and repair damaged, dry hair and repair split ends. This is like magic to the hair if used on a regular basis. This also a “NAPtural” girl’s secret hair weapon! All of these this I know from working closely with a woman who is from West Africa and runs her own skin care line that is Shea butter based. 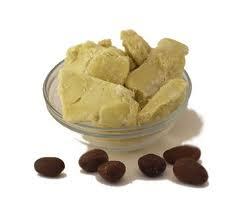 Shea Butter is also used for eczema and it can relieve pain from swelling and arthritis. It can Improve muscle relaxation and stiffness. It also has a natural sunscreen in it due to its rich content of vitamins E & F. It treats dark spots, skin discolorations, stretch marks, wrinkles and blemishes. You can also use it for massages and diaper rash. This is very important to know. It does not perform miracles like most things it requires patience in order to work effectively. The amount of time required for the best results with a variety of conditions may vary with each condition. Cons: You might not like the smell and it is oily upon application but ANOTHER Pro It absorbs fast! If your shea butter looks yellow. It is NOT 100 % shea butter it has palm oil in it and that is why it is yellow. 16 Oct 2012 Comments Off on I’ve Discovered Darcy’s! Happy Tuesday! So you know how I like to mix my own skin and hair care products but I have also admitted to not being completely chemical free or product free. I do try my hardest when I can to try brands that are mostly natural but sometimes it’s impossible and other times you just go to the beauty suppy and go for what you know. I discovered a brand called Darcy’s Botanicals (And I mean JUST discovered it) that is very natural and I am interested in trying it. I found this brand on Curlbox and I found out about Curlbox from a fellow WordPress blogger. I love this community, it’s so informative and open to sharing. So I found out about Darcy’s Botanicals and I poked around the site a bit to find that this line has products for skin and hair that is eco friendly and organic. The ingredients are things like Organic Palm Fruit Butter, Organic Coconut Oil, Cherry Kernel Oil, Olive Butter, Cocoa Butter, Candelilla Wax, Agave Nectar, Vitamin E and a different natural ingredients for different things. I’m sitting here reading the product list and I can almost smell them. I can not wait to try the Juicy Peach Kernel Nectar. I love the way peaches smell so I’m looking forward to putting it all over my skin and hair. I am sharing all of this with you guys because I’m exited about what I have just found and when I have tried for a while I will tell you what I think. In the mean time if you know nothing about this product line let’s experience it together. I love this recipe by Handhug Beauty so I decided to reblog. I do not like papaya so it’s great to know it’s good for something I can use. Yay! I havent tried this one yet so I’m just gonna post it and then when I do try it I will post my experience later. Leftover Wine and Fruit Reuse: Vinegar! I just wrote a post on Apple Cider Vinegar and I thought this was a great post to compliment it especially since we are all about DIY! Wine aficionados claim that a bottle of wine should be consumed within 36 hours before the perishable liquid inside starts to deteriorate. Once oxygen is introduced, the wine begins to change. Recorking or sucking the air out of it will only deter the deterioration by a matter of hours. Putting the bottle in the refrigerator might help keep it for up to a week, but after that, it’s time to make wine vinegar! Vinegars are so easy to make, it’s almost a crime to not make them with your leftovers. In a glass jar combine 2 cups of leftover red wine with a cup of distilled water and some “mother” from a previous organic vinegar you’ve finished and cover the jar with cheese cloth or a clean piece of cotton cloth so air can get in and dust stays out.